A disabled North Korean defector has established a rescue ministry that is currently helping defectors who are being abused in China find undetectable paths into the democratic haven of South Korea. 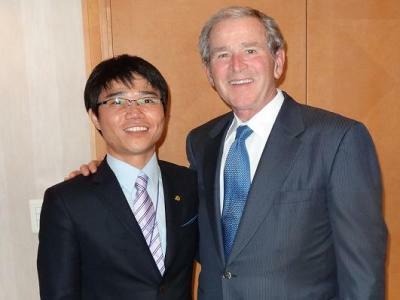 Ji Seong-ho, who founded the organization Now, Action, Unity, Human Rights (NAUH) in April of 2010, told The Christians Post in a Monday phone interview that his group consists mostly of prayer-sharing Christians who have already helped 76 North Korean defectors living as unrecognized refugees in China make their way through Underground Railroad-like excursions, spanning across several countries, so that they can ultimately resettle with the liberty offered in South Korea. Ji, who claims to have once been tortured by North Korean police, said that defectors in China are still treated horribly even after successfully fleeing from the numerous atrocious human rights abuses carried out by the North Korean government. Many of the defected women, according to Ji, are sexually trafficked and abused in China, while defected men in China are forced to work for no wages. Defectors have no human rights in China, he stated. "Because it is illegal for them to stay in China, their fundamental human rights are not respected," Ji said. "North Korean refugees go through a lot of difficulties after crossing the border … when they defect from North Korea, they usually don't even have proper clothing." NAUH, which is based out of the South Korean capital of Seoul, helps these refugees by not only providing them with clothes and other humanitarian needs but also provides crucial communication to help refugees get in contact with the group's external contacts in China, who help carry out the rescue missions. Ji, who was once so impoverished during the North Korean famine of the 90s that he used to steal coal to support his family, said that he funded the startup of the organization with just $200 and has since been receiving donations from a number of individuals and organizations around the globe that have helped his organization to grow. The National Endowment for Democracy is a major supporter. But since NAUH still only has limited funding and can not help every North Korean defector, the group must listen to the testimonies of all those seeking help and then choose which situations are the most dire. NAUH uses the majority of its funding to carry out the rescue missions, which requires planning and organizing the various routes and various means of transportation that the defectors must use. The group also examines geographical and political issues that could cause trouble for the defectors during their journey. Ji said the path designed for defectors is really based on a case-by-case scenario. "They have to keep secret and hide from [North Korean police in China]. They have to help the defectors move in the safest way possible," he explained. "Usually, the refugees go through, on average, four different countries before they reach South Korea, they use all kind of transportation like train, cars, taxis or walk whenever necessary." "During the time, I was asked whether I was contacted by any Christians. I actually did meet Christians and was introduced to Christianity [when I first went to China] but I already knew that Christians when caught by the regime will be killed without any exceptions. So I denied that I came into contact with Christians," Ji recalled. "During the torture, it was of course a very difficult experience. That was then I felt that North Korea is no longer the place I could live." Although Christians in North Korea are often tortured, killed and placed in concentration camps, Ji did not hone in on his faith in Christ until he suffered severe hardships during his own four-country trek that forced him — as a man with one arm and one leg and relying on crutches – to swim across the Tumen River and later climb mountains to enter into Laos. During this voyage, he prayed a few times to God and asked that He assist in helping him make it across the river and over the mountain. He additionally prayed that God would help him to one day assist others, who would be faced with the same tough and trying excursion, accomplish their mission. Although it took a few years after he settled in South Korea for him to begin helping others as he requested in his prayer, Ji's prayer has finally come true. "Now, I am running this human rights group and helping North Korean refugees who go through similar difficulties as I did through rescue operations," he said. "I feel that my prayer is answered and came true." NAUH plans to create and send Christmas cards to each country's embassy that supported the recent United Nations Security Council Resolution to accuse North Korea of crimes against humanity. The resolution will encourage the people of North Korea, he noted, because it lets them know that the world stands with the people of North Korea, not the communist regime. The group is also selling Christmas cards and the proceeds will go toward more rescue missions of North Korean defectors in China. Ji said he is saddened to know that many people in North Korea do not know what Christmas is. Despite North Korea's cruel imprisonment and murder of anyone who advocates religion in the country, there is a Christian responsibility to tear down North Korea's wall against Christianity and religion so that North Koreans may begin to worship and find joy, he stressed. "I want to plead the international community to help out with this cause to tackle the human rights situation of North Korea and create more pressure against the regime so that people would have freedom to pray and worship God, and share the Gospel and hear the Gospel," he stated. "I also feel that since the Bible commands us to share the Gospel to the world and every nation, we also have to deliver the Gospel to North Korea as there can be no exception in place we need to reach out to. I am also hoping that North Korea will one day be able to celebrate and share the joy of Christmas."